Now the older son had been out in the field and on his way back, as he neared the house, he heard the sound of music and dancing. He called one of the servants and asked what this might mean. The servant said to him, 'Your brother has returned and your father has slaughtered the fattened calf because he has him back safe and sound.' He became angry, and when he refused to enter the house, his father came out and pleaded with him. He said to his father in reply, 'Look, all these years I served you and not once did I disobey your orders; yet you never gave me even a young goat to feast on with my friends. But when your son returns who swallowed up your property with prostitutes, for him you slaughter the fattened calf.' He said to him, 'My son, you are here with me always; everything I have is yours. But now we must celebrate and rejoice, because your brother was dead and has come to life again; he was lost and has been found.'" "God has given us the ministry of reconciliation . . . so we are ambassadors for Christ, as if God were appealing through us" (2 Cor 5). This weekend marks the midway point in our Lenten journey. We used to refer to the Fourth Sunday of Lent as "Laetare Sunday". "Laetare" from the Latin word meaning "to rejoice". We are to rejoice, not because the period of self-denial, increased prayer and works of charity is half over and we can return to former ways of behaving. Rather, we are to rejoice because our celebration of Jesus' victory over sin and death will soon be here. We also rejoice because during Lent - a season of conversion - so many have come to a deeper relationship with God. As the first Lenten preface states: "Each year you give us this joyful season when we prepare to celebrate the Pascal Mystery with mind(s) and heart(s) renewed". 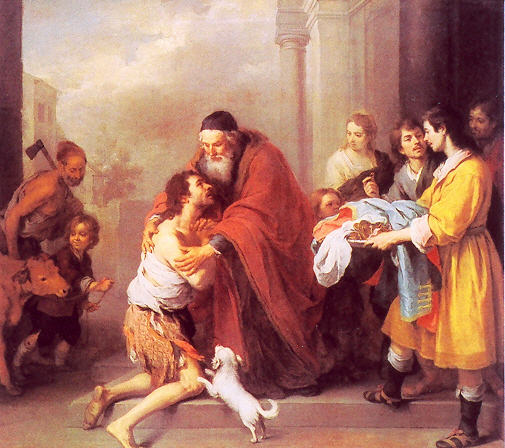 St. Luke's gospel parable has often been referred to as: The Parable of the Prodigal Son". Webster's dictionary defines "prodigal" as "reckless extravagance". Someone once remarked that if that be so, this parable might better be called, "the parable of the prodigal father". The father was recklessly extravagant in receiving back the son who had squandered his inheritance. The father went recklessly against the custom of the time which decreed that anyone who had so dishonored his father and relatives should be shunned by the community. Jesus used the extravagant welcoming of the father to illustrate God's infinite mercy and forgiveness. Jesus had told his followers: with God "There is no unforgivable sin". "Even though your sins be a scarlet", he said, "They can be made white as snow". St. Paul told the Christians at Corinth - and it applies to us as well - that "God has given us the ministry of reconciliation . . . so we are ambassadors for Christ, as if God were appealing through us". If we are to be effective ambassadors of reconciliation, it follows that we, ourselves must first be reconciled to God and to one another. As an old adage states it: "No one can give what he does not possess". The gospel parable illustrates the appropriateness of calling this 'Lord's Day' "Laetare Sunday". Lent is a season in which many Christians experience a positive change in their spiritual lives. It is, indeed, a joyful time of conversion and renewal.